Scooters are known for having more storage space than the average motorcycle. Because the engine is actually connected to the rear wheel, that leaves a lot of room under the seat for stuff. It's convenient, but it still limits the utility of the bike when you want to buy more than some milk and bread at the store. 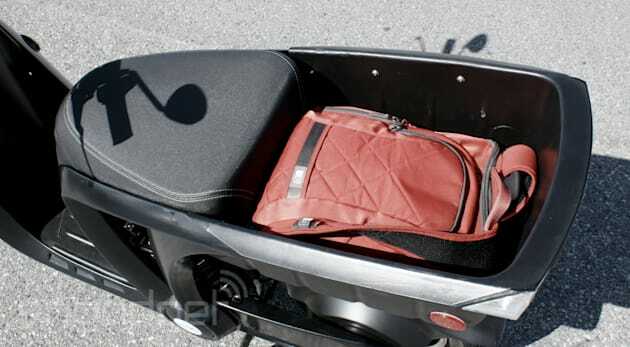 The new GenZe 2.0 electric scooter not only has that under-seat space, but also sports a relatively huge bed (called the "BackBay") behind the seat. It's like a tiny two-wheeled pickup truck that can handle a few pizzas, a backpack or your dirty clothes as you take them to the Laundromat. I didn't have pizzas or filthy clothing to toss in the back, but I was able to take this urban utility scooter for a spin on Treasure Island before its launch in San Francisco and Portland, Oregon, this fall. Built in Michigan by India-based Mahindra, the aluminum-frame GenZe 2.0 -- like a lot of scooters currently available and coming to market -- is technically a moped. The onboard software keeps the top speed at 30MPH. You might not be able to keep up with traffic on streets with a 40MPH speed limit, but you also won't need a motorcycle license to ride it. The bike has three modes: Sport, Economy and Easy. Easy mode eases new riders into the wild and wooly world of traveling on two wheels by limiting acceleration. Once you've done that, you'll never use it again. For me, Economy is only for when I realize I'm in danger of killing the battery on the ride home. Fortunately, it has a range of 30 to 35 miles on a single charge and the battery is removable, so you can park the scooter and take the battery inside with you to charge it. The rather heavy battery (Mahindra says a lighter one will be available next year) takes about three and a half hours to charge. Because I'm usually in a hurry, I picked Sport mode. Acceleration is on par with other electric scooters regulated to moped mode. It's smooth and eventually gets you to the top speed within about half a city block. While it's not going to be flying down city streets, it's a bit safer than the average scooter thanks to the 16-inch front wheel that makes it extremely stable. 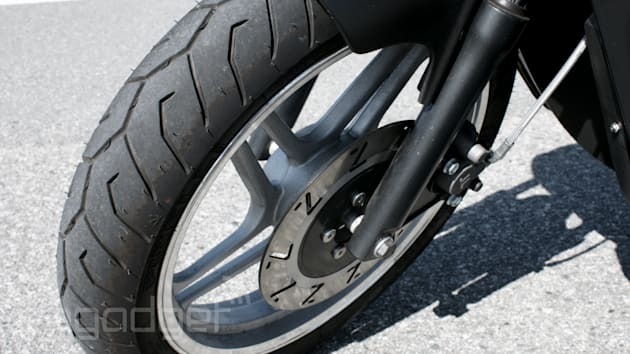 I could feel the bike trying to right itself as I leaned side to side while cruising down the road. The large wheels (the rear one is 12 inches) also have the added advantage of making all those potholes your city refuses to fix less of a danger than if the GenZe used the smaller tires found on other bikes. Plus, that added stability also makes slow turns easier. I was able to pull tight circles while doing 2 MPH. As for hills, Mahindra says the bike will tackle an 8 percent grade at 30MPH for half a mile. Helpful for topographic wonderlands like San Francisco. Unfortunately, Treasure Island was built to be as flat as a board, so no hill-climbing tests for the pickup-inspired GenZe. Like an actual truck, the sitting position is upright. There's no leaning forward; the high handlebar position keeps that from really being much of an option. My daily rider is a Vespa that also lends itself to an upright riding position, but this is far more pronounced. Right off the bat, the bike is trying to fix my horrible posture. After a few blocks, I got used to sitting at attention while riding. On that high handlebar, though, is a 7-inch touchscreen that shows off your usual speed, battery and range stats. It's also how you unlock the bike. As with a smartphone, a PIN code is needed to start the GenZe. But, the most exciting feature is the ability to adjust the power and regenerative-braking settings of the bike directly from the display. Riders can customize their experience with a few flicks and taps. These settings can also be adjusted via a companion app. The features meant to woo urban gearheads don't stop there. On the final production model, riders will also be able to top off their smartphones and other devices using two 12-volt charging ports. One will be located in the under-seat compartment so you can charge your phone while you store it. 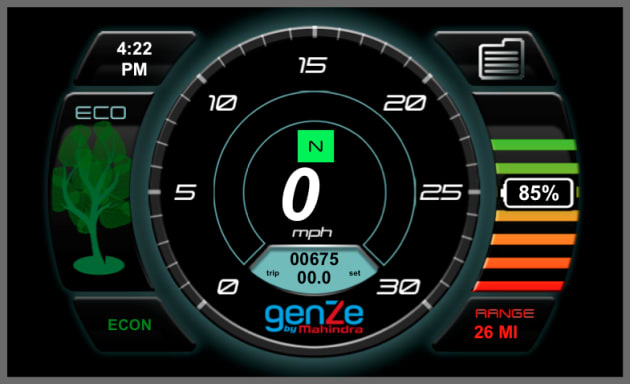 Oddly, the GenZe also has a reverse mode. I guess you could use it to back out of spaces. ¯\_(ツ)_/¯. As for the BackBay bed in the back, the stock bike will have the rather large bucket that housed my backpack and DSLR with plenty of room to spare. There will also be hooks on the production model for bungee cords so all your stuff doesn't go flying into the street. But customers also have the option to upgrade the bay with a lockable lid and other accessories when the bike launches, which should be somewhere in either late September or early October. Expect it go for $3,000, with availability starting in San Francisco and Portland. While the GenZe will be available for individual purchase, the company is also interested in fleet sales to colleges, resorts and rental services like Scoot. Don't be surprised to see a few of these filled with coolers and towels the next time you visit a beach town or in a city where people want the freedom of two wheels, but still need to do things like go shopping for more than a loaf of bread.